A year ago this weekend, dazed by the sudden loss of the Shuttle Columbia, I stopped by NASA's Goddard Spaceflight Center's Visitor's Center in Greenbelt, Maryland to see if there were any public observances. The public area was closed, so I just made a photo of part of the sign by the main employee entrance where passers-by had left bouquets of flowers. Later that night, after returning by train to Manhattan to begin the work week, I left a photo of the crew on the fence of St. Paul's Churchyard across the street from Ground Zero. A year later, after an exhaustive and harshly critical investigation of NASA, a resumption of preparations for the next Shuttle's return to space, and the continuation of Space Station operations, NASA is beginning to make a comeback. Two robotic rovers are now operating on Mars, and returning science data beyond all expectations, and the president has put forth a bold vision for manned missions to return to the Moon and venture to Mars. Yet serious questions remain about the slow change in NASA's culture, which cast doubt on the agency's ability to continue flying the Shuttle muchless to embark on building an entirely new vehicle to carry astronauts to the Moon. 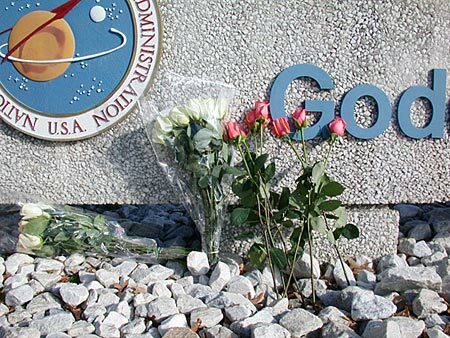 One can only hope that the memorials honoring the Columbia and her crew online, on the ground, and on Mars will also mark an end to the old way of working at NASA. The next memorial NASA needs to build is to commemorate the decades of safe operations that will be required to get humans to Mars. I watched Bush's ho-hum delivery of NASA's new vision for manned space exploration today at a bar at O'Hare Airport. I agree we should continue human exploration of space, and the very conservative approach to budgeting (PDF file) resources over the next 15 years seems, at a glance, workable. Assuming the vision proceeds as described, I wonder how we, as a country, will be able to maintain a focus on probing far frontiers in light of the planet's pressing problems. Late nights, haven't each and all of us thought to ourselves, How did we get here? Where did Earth come from, and how did the people on Earth arrive? We have thousands of religions with 10,000 answers and none of them completely agreeable. Years ago I took an incredible light-year glance at the cosmos, wallowed in panic and shouted so I could hear over the din of facts from the farsighted astronomers. "What if there never was a Big Bang?" I heard myself say." "How's that again?" I gasped. "What if there never was a Big Bang?" my demon muse replied. "What if the universe and all its galaxies and hot-fire suns and hot and cold planets were never born and simply always existed?" "So is the Big Bang," said my demon muse quietly. "Look up: 10 billion light-years of stars. Look sideways, you'll see the same. How the hell do you find and detonate a Big Bang that immense?" "You said it," said my demon. "You mean the universe has been here forever?" "It's scary stuff. The universe has existed beyond time and eternity, waiting for the final thing." "Us. It lacked one miraculous item. It was a cosmic theater but with 10 million times a million empty seats. The stars knew not themselves. The moons and planets were born deaf and blind, unhearing, unseeing, unfeeling. The great tomb yards of space were just that: gravestones with no names. The universe collected its genetic phlegm and at last coughed forth"
"An audience. It needed to be seen, heard, sensed, touched. It needed to be recognized and applauded. We are that audience. We, you and I, have been birthed amid the blind, mute, soundless tombstones to stand upright in a rain of senseless light and shout against the dark. Religions? They're false. We are our own religions. We are our own gods. That's why it's up to us." "So," I said, "that's what it's all about. Millions of watchful humans birthed as half-formed philosophers who have asked again and again, 'Why are we here? Why are we alive? To what mysterious purpose were we born? Give me a reason for life and living.' "
My muse replied, "What's the use of a universe unseen, a theater of empty worlds? We are here, hallelujah! And again wild hallelujahs to witness it all, to witness celebrate and explore." This is a Flickr badge showing public photos from curiouslee. Make you own badge here. Recent posts to my personal moblog at hiptop Nation from all manner of locations using my T-Mobile Sidekick. Does the broken windows theory hold online? Danah Boyd - Can the iPhone hit crucial network density for noticable cluster effects? Avi Solomon on A Laptop for "When I'm 64." Dot Tassone on Need it now! A Laptop for "When I'm 64."